One of the worst parts of traveling is … the traveling! We’re sure everyone can agree that there is nothing worse than a long, uncomfortable bus, flight or train ride. Waking up groggy, sore and aching in all sorts of places isn’t at all enjoyable. 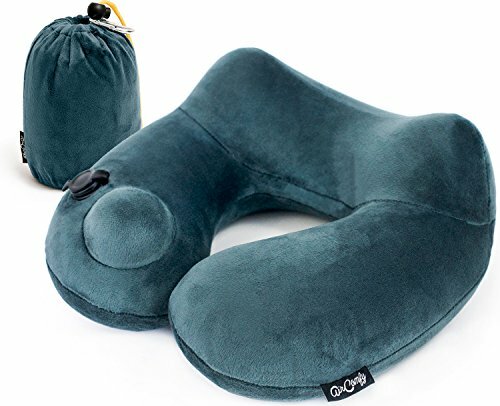 A simple item you can use to add comfort to your journey is a Travel Pillow. These are pretty common items and you’ll often see them hanging on the necks of seasoned travelers. So with that in mind, we’ve put together a list of the best travel pillows you can get. The pillows come in different sizes and fits and are all designed to somehow work differently. Some are better fits for different people so it’s important you get the right one for you. We’ve written a guide explaining the nuances, so read on below to find out more. 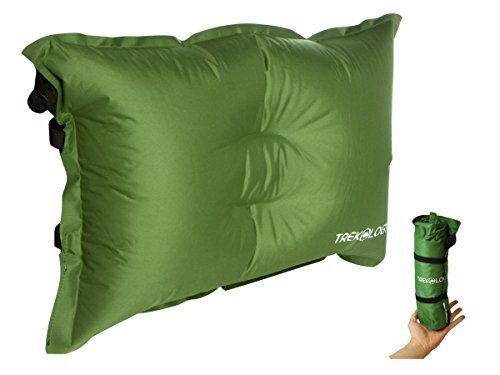 2.1 What Makes a Good Travel Pillow? 2.2 Which Shapes Are Best for What? 2.3 Have You Got Enough Space? 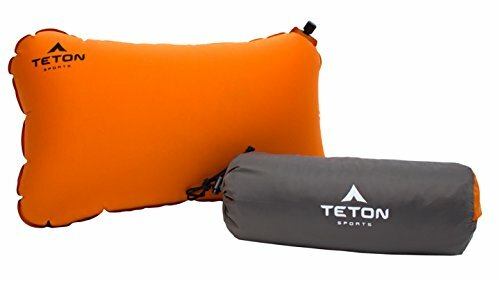 2.4 Self-Inflating Pillows or Not? 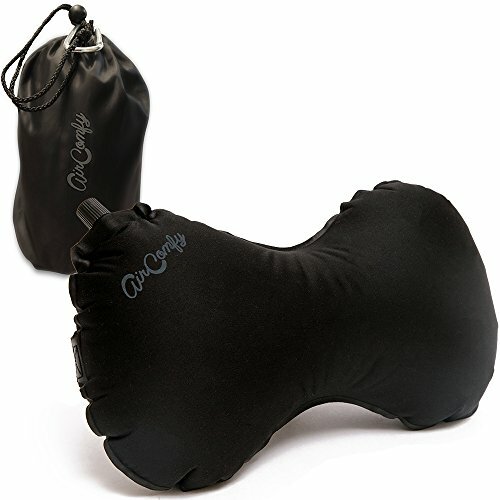 The Aircomfy Pillow is an ergonomic and versatile pillow. It stands out because it can be used for neck, lumbar, mid and upper back support whilst other pillows only have 2 or fewer uses. It has a sleek and low profile design which makes it look stylish and low profile. It comes in a variety of colors with a few options to choose from. One of its key features is an elastic strap/band that can be tied/wrapped on headrests to help keep it in place. This is especially useful if you find a comfortable position and want to maintain it, or if you are prone to shift about in your chair. But wrapping the band can be tricky if the person behind you on a flight is using their screen. It features a layer of foam, so is slightly firmer than the other inflatable options on this list. This pillow is on the higher side of cost but is worth it due it’s unique and useful features. This pillow more than satisfies peoples needs but if you want something specifically for the neck, check out the Daydream pillow. The daydream pillow comes in a U shape. This means it’s specifically designed for neck support. It features a micro velvet pillowcase that you can remove, wash and keep fresh. This is useful for the germaphobes among us, and in case you spill drinks or any sticky fluids on it. The pillow casing is made from micro-velvet, so unlike micro-fiber which can be wiped, you will have to wash this eventually. 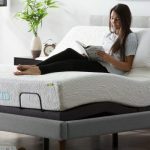 It has a self-inflating valve that allows you to release air from the pillow as you wear it, allowing you to get the perfect setting of squishiness or of firmness. Finally, the packsack is super compact and lightweight and features a satin liner for easy packing and unpacking. The pillow is highly specialized and perfect for those who want neck comfort. It is also really compact and can be fit in tight spaces. Like the Aircomfy, it features a clip so can be hanged outside a bag if needs are. 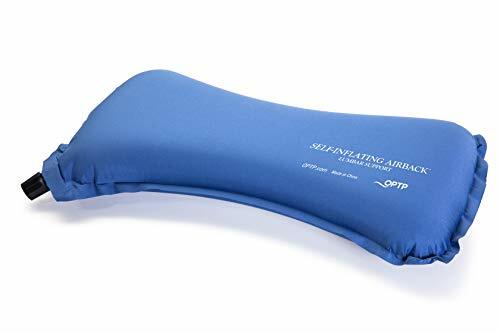 However, it is too specialized and I highly recommend the Aircomfy if someone wants something for both back & neck support. The Teton pillow comes in a traditional pillow shape and is the biggest on the list at 18in in length and 10in in width. It was designed specifically with camping in my mind, but is also super useful for flights and use on chairs and in cars. The trick to this pillow is deflating it and then contorting it to fit your needs. It’s so large so this way it cradles your head or your back to provides a lot of comfort and support. For material, you can either choose from a microfiber or cotton casing and both give a soft and comfortable feel. The microfiber can be cleaned by simply wiping it down with a damp cloth, but it might be harder to deal with the cotton. Finally, the pillow comes with a lifetime warranty so it is guaranteed against any defects. This pillow is great and is suited to everyday uses. It is most comparable to the Aircomfy and they cost around the same. If you’re looking for something similar and budget-friendly, check out the Trekology. The Trekology Pillow is shaped similarly to the Teton and is almost as big. It comes in at 17in in length, 10in in width and 4in in thickness. It’s designed to have many uses and can be used for back support, as a cushion or as a headrest. Indented in the center, it has a contour that is designed to cradle your head and minimize side to side movement. It also features slip-resistant material on the back and soft material on the front for comfort. However, the front material is ruffly and can be a bit noisy if you move your head. The material is durable and won’t tear easily or be damaged by water. It’s the most budget-friendly option on my list but you do get what you pay for. Trekology have cut corners on the material and it could be better. However, it is really compact and won’t take up much space in bags. Perfect for travelers on a budget with limited space. 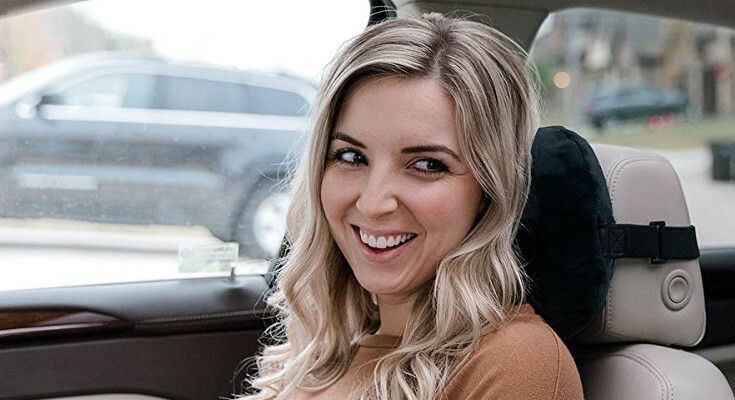 The Original McKenzie Pillow is designed primarily for back support. It’s been designed by Orthopedic experts with over 25 years of experience. It keeps your back perfectly aligned and provides perfect support to all the relevant areas. It’s highly recommended by a lot of professionals. However, the pillow is a bit costly and is highly specialized. If you mainly need back support, this is the one to go for, but if you need head and neck support too, this pillow will be unable to accommodate that. If you need something more versatile, check out the Aircomfy or Teton pillows. Both can provide head and back support. Finally, the pillow is quite small so it will be easy to lose. Don’t forget it on the plane or in the car. What Makes a Good Travel Pillow? Different pillows are designed to target different areas of the body. The perfect pillow is one that will target the area you have the most issues with. For example, I have problems with my neck when traveling, so I should go for a pillow that will provide comfort to my neck. Vice verse if you got back problems. No need to purchase something if it isn’t going to solve any issues. Which Shapes Are Best for What? U-shaped pillows are specifically designed to go around your neck. These will be pretty much uncomfortable to use on your back or on any other part of the body but will work really well around your neck and give great comfort. Pill shaped pillows are specifically designed to support the Lumbar region of your back (the lower back basically). Now with these are fantastic and keep your back comfortable through long hours of seating. You can even use them at the office and in your car, they’re not limited for travels alone. They can be used for neck support but won’t be as good as the U shaped pillows. Finally, we have the best of both worlds. Pillows like the Aircomfy are two in one option and can be used for neck or lumbar support. However, they won’t work as well for the neck as the specialized U shaped pillows do. Have You Got Enough Space? All the pillows on my list are self-inflating and can be deflated to make them more compact and storable. This option is great for backpackers and for people with limited luggage space. However, deflation at high-altitudes is normal for these pillows and they sometimes (though very infrequently) have issues with the air valves. Though, if you have limited space in your bag/luggage these are not a wise option. However, if you got something like a car, these are pretty great to have. Self-inflating pillows are generally a good option. They make sense if you don’t want to spend 5 min huffing and puffing into a plastic tube, which might not even be hygienic at all if you haven’t washed it or if you share it with someone else. Though all things considered, it really is down to personal preference which you prefer. I believe that the best all-around product was the Aircomfy Pillow. Though yes, a bit on the pricey side, the pillow is really versatile and had a lot of options for how you could use it. It’s basically a 3 in 1 pillow. You could pick between a fixed position (thanks to the strap), lumbar support or have it cradle your neck. It is also really compact for storage and features a clip. This means it could easily fit in your bag, but if not, you could clip it to the outside and let it hang as you carry it around. I highly recommend it to backpackers and other travelers because of its versatility and many uses. It will not disappoint.